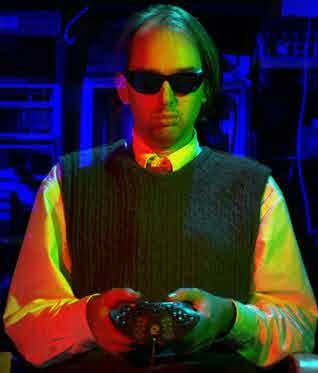 Professor Steve Mann, of the Dept. of Electrical and Computer Engineering at the University of Toronto, is reputed to be the "Father of Wearable Computing." This picture is from the web page of a class he used to teach "Introduction to Micro-processors." He is holding the AlphaGrip, which he plans to use in his computer interface course as an example of a well-designed input device.